CHICKS ARE HERE FOR 2019! These chicks have some Araucana and some Ameraucana breeding mixed and consequently are not for show but are beautiful chickens known for their ability to lay colored eggs of shades varying from turquoise to blue. Each bird will typically lay a different shade of colored egg that will amaze your friends and make a wonderful “show and tell” type project for school. Adults are of medium size with pea combs and this breeding stock are selected for their ability to produce colored eggs. They exhibit a wonderful combination of colors and color patterns and 10 or 20 of these birds will make an absolutely beautiful laying flock that is extremely hardy and will be the talk of the town. Baby chicks come in all colors, plain and fancy, just like the adults. This is a unique breed and great fun to have when the colored eggs start coming. These chicks are recommended for egg laying color and ability, not for exhibition. This is the original Jersey Giant developed in New Jersey in the late 19th century by crossing several of the large, dark Asiatic breeds. It is a super heavy bird even a little larger than the whites. It’s black plumage has a beautiful green sheen, the eyes are dark brown, shanks and toes are black except for yellow skin showing on the bottoms of the feet. With the straight red comb and tremendous size it makes an unusually handsome variety for exhibition. Hens are good layers of brown eggs and especially persistent through cold weather. 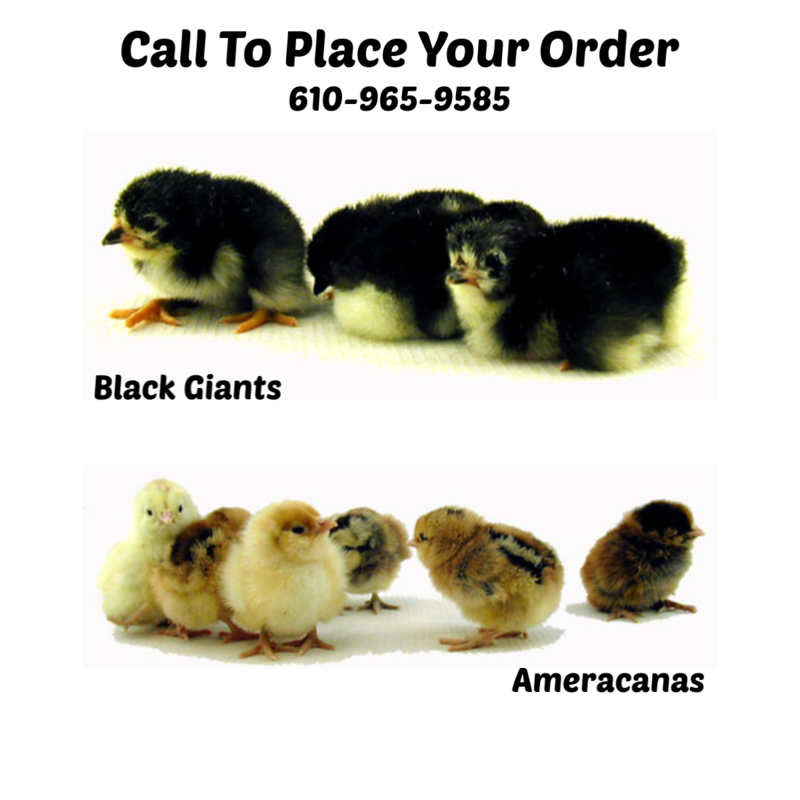 Baby chicks are mostly black but do show creamy patches on the underbody, wing tips, and around the face. The white persists in the plumage until final molt of chick feathers takes place. Dr. Tom Whiting, a poultry geneticist specializing in developing feathers for the fly-fishing industry, developed the Whiting True Blue. With his broad background in poultry genetics, he developed this breed to lay a consistent blue egg as you can see in the photo. These are not Araucanas, Ameraucanas, or ‘Easter Eggers’, they are their own breed. The birds will have varying feather patterns and coloration, which will add color and beauty to your flock. They will breed true for egg color, but will segregate into a myriad of plumage colors. Leg color will vary with plumage color. Egg size will start out with medium size eggs and progress to large eggs given adequate nutrition. Day Old Chicks: When landing in our store, they will need to go into a brooder to keep warm, much like a mother hen would do if she hatched them. Chicks will need water and food right away and will need to stay in the brooder for several weeks as they grow and feather out. Once they no longer need supplemental heat, they can be introduced into an outdoor coop. People around the country have started going organic by growing their own organic produce at home, while some are taking it a step further and have started raising backyard chickens for fresh eggs and poultry. People are happy knowing what their chickens are fed and how they live. Raising backyard chickens give the owner a measure of self-sufficiency. Before you begin, you should know what raising backyard chickens will entail. Is it legal to raise backyard chickens in your municipality/borough? You will need to contact your local township or borough office to find out if there are any restrictions BEFORE you begin this new venture. Decide whether you can handle sharing your home and living space with baby chicks for roughly 4 months. Don’t have more chickens than what you have the room for. 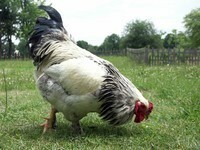 Figure a minimum of 1 1/2 to 2 square feet per chicken inside the hen house and 8-10 feet of yard outside. Remember that chickens like to spread their wings and interact. Herbein’s offers 2 styles of hen houses for you to choose from: Premium Hen Hut w/ Yard, and a Backyard Charm Free-Range Hutch. The Hen Hut with Yard is a premium quality home for the backyard flock featuring a covered screened porch for a “free range” environment. Made by craftsmen of high quality lumber and rustproof galvanized wire. The Free Range Hutch offers a simple, easy care hutch perfect for laying hens. Built in nest box is secure and features a fully opening front door for easy egg collection. Metal pull-pan makes cleaning simple. Deluxe features include fold down side door ramp, predator proof lock, and solid wood shutters. ‘Manna Pro’ Easy Clean Pine Bedding – 4 cu. ft.